Hollywood has the Walk of Fame. Zermatt has the Walk of Climb. The bronze markers along the Bahnhofstrasse honour nine Alpinists: the first ascenders of the Matterhorn (4,478 m). Seven first climbers reached the summit on 14 July 1865. During the descent, four mountaineers fell to their deaths on the north wall; three survived. The first marker is near the Zermatt catholic church. 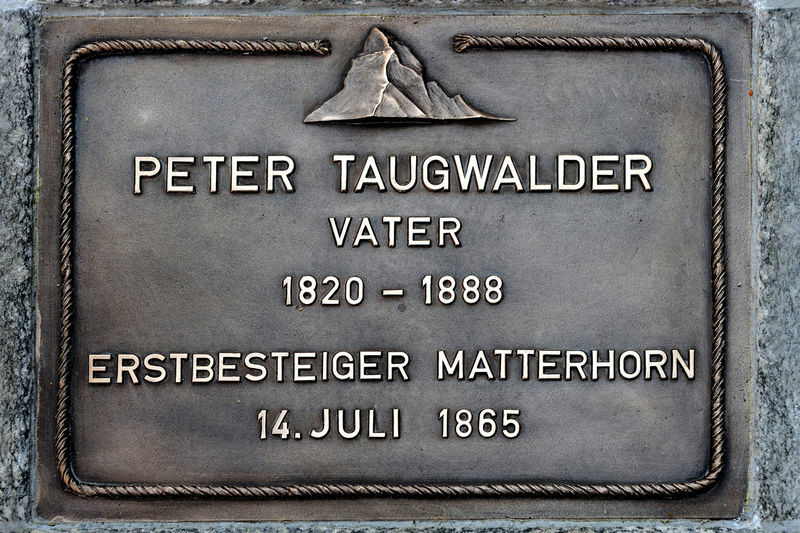 It bears the name of Peter Taugwalder Vater, Zermatt mountain guide of the first climbers’ rope team. Following this are his son, Peter Taugwalder junior, mountain guide, Michel Auguste Croz, from Chamonix (perished during the descent), the Englishman Edward Whymper, the Reverend Charles Hudson (perished), Lord Francis Douglas (perished), Douglas Robert Hadow (perished). Two further markers immortalise the names of the first ascenders, who reached the summit from the Italian side on 17 July 1865: Jean-Antoine Carrel and Jean-Babtiste Bich, both from Valtournenche, Italy. Over the course of the years, further markers inserted into the ground of the Zermatt Bahnhofstrasse will follow to highlight to extraordinary efforts of Alpinists on the Matterhorn. The Walk of Climb has been inaugurated during the jubilee week of 150 years of the first ascent on the Matterhorn in July 2015. This in presence of many of the descendants of the first alpinists on the Matterhorn from the four involved countries: Switzerland, UK, Italy and France.